If you want to list your ads so that they display in paid search engine results, you can use Google AdWords. AdWords is Google’s paid search program that lets you create your own ads, choose your keyword phrases, set your maximum bid price, and specify a budget. If you’re having trouble creating ads, Google has a program to help you create and target your ads. It then matches your ads to the right audience within its network, and you pay only when your ad is clicked. How much you pay varies greatly depending on the keyword because competition drives the bid price. For instance, a keyword like mesothelioma, the cancer caused by asbestos, runs about $56 per click. Lawyers love this one because a case could arguably net them hundreds of thousands of dollars, so it’s worth getting the one case per hundred clicks, and multiple competitors drive the price up through bidding wars. You can activate an AdWords account for $5, choosing a maximum cost-per-click (how much you pay when the ad is clicked) ranging from one cent on up; there’s really no limit. Google provides a calculator for determining your daily budget, along with information on how to control your costs by setting limits. Google also has stringent editorial guidelines designed to ensure ad effectiveness and to discourage spam. Payment can be made by credit card, debit card, or direct debit, as well as via bank transfer. With Google AdWords, you have three placement options available to you. The most common is for your ads to appear on a Google search engine results page based on a keyword trigger. The second option allows your site to show up in the search results pages of Google’s distribution partners like AOL and Ask.com. The third option is site-targeted campaigns in which you can have your ads show up on sites in Google’s content network (via Google’s AdSense publisher platform). Site-targeted campaigns are based on a cost-per-thousand-impressions (CPM — the M stands for mille and is a holdover from the old printing press days) model with $0.25 as the minimum per 1,000 impressions. Google has also recently introduced limited demographic targeting, allowing advertisers to select gender, age group, annual household income, ethnicity, and children/no children in the household (which raises the price, but also increases the potential effectiveness of your ad). 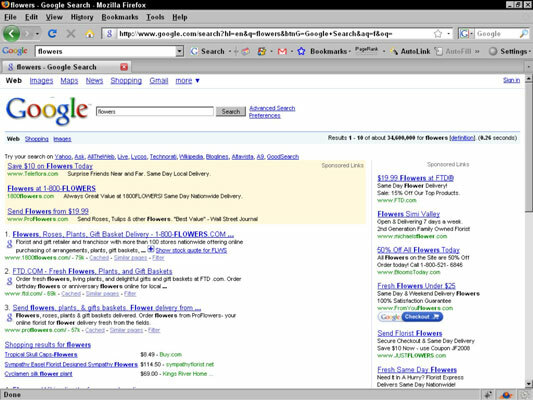 A screenshot of Google ads. Most people want to advertise on Google because their ad has a chance of appearing across a wide range of networks, like America Online, HowStuffWorks, Ask (U.S. and U.K.), T-Online (Europe), News Interactive (Australia), Tencent (China), and thousands of others worldwide. Notice in the above figure how Google tries to target the ads based on the content of the Web page where the ads appear. An established brand: Google gets the most searches (61.5 percent in June 2008). Both pay-per-click and pay-per-impression cost models. Site targeting with both text and image ads. Costs automatically reduced to the lowest price required to maintain position. Immediate listings mean your ads go live in about 15 minutes. No minimum monthly spending or monthly fees. Multiple ads can be created to test the effectiveness of keywords. Conversion tracking tool that helps identify best performing keywords, define your target market, and set an ad budget. You can easily import your search campaign, pay on a cost-per-click (CPC) basis, and access millions of unique users.